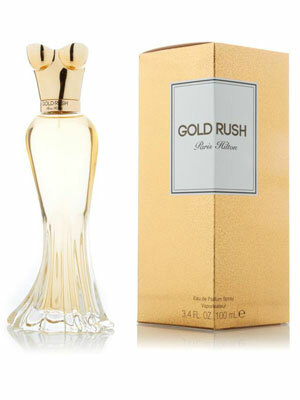 Gold Rush Paris Hilton is the 20th perfume launched by the celebrity, and celebrates the 10th anniversary of her fragrance line. This new fruity oriental fragrance for women is a more sophisticated fragrance with notes of lemon, orchid, rose, violet, vanilla, and cashmere woods. The perfume bottle resembles the draped cut of a evening gown, with a golden bodice-shaped cap, inspired creative director Doug Lloyd of Lloyd&Co. Launched in June 2016 on HSN and nationwide in August 2016, the new celebrity scent is available in eau de parfum spray (1 oz - 3.4 oz. $32-$60), rollerball, and matching body products from Perfumania.